Welcome to Emerald Grande! An experience like no other in all of Destin! Your condominium features 9-foot ceilings, upscale cabinetry, and crown molding throughout. The expansive kitchen features stainless appliances, granite counter tops, breakfast bar, and Italian porcelain floors. The open floor plan of the living area, dining room, and kitchen create a relaxing environment and your private patios offer easy access to the Grande Vista Pool Deck. The spacious master bath features an over-sized tub, separate shower, and double vanities. The pink lamp and white cabinet next to TV not included in sale.Upon arrival, you will be greeted by bell service who will unload and deliver your belongings directly to your private home away from home. Emerald Grande is the centerpiece of HarborWalk Village with restaurants such as Harry T's and Margaritaville, retail shops and boutiques, and access to HarborWalk Charters Fishing Fleet. This resort is one of the most sought after locations along the Emerald Coast. Emerald Grande's amenities include a front desk/lobby area featuring solid cherry floors, 22-foot ceilings, chandeliers, stained glass, with a hand-crafted 15-foot chrome compass inlaid in entryway floor, not to mention the smiling faces behind the front desk always ready with a pleasant greeting! There is full-time concierge service, room service, and daily maid service available. The ultra-luxurious pool deck with Harbor views offers fun for all ages. A full European spa and fitness center offers all the luxuries you expect at a premier destination. Enjoy taking one of the two private boat shuttles to the sugar white beaches that Destin is famous for. The five-deck garage has covered parking and 24-hour manned security monitoring. 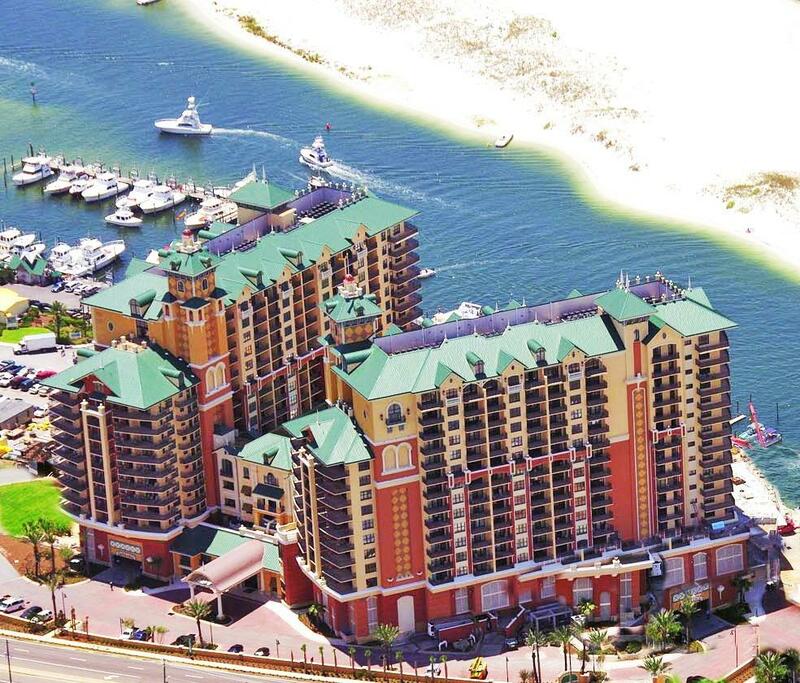 There is no other resort like this one on all of the Emerald Coast! It's no wonder that she has been nicknamed ''Jewel of the Emerald Coast''! This is truly a Grande experience!